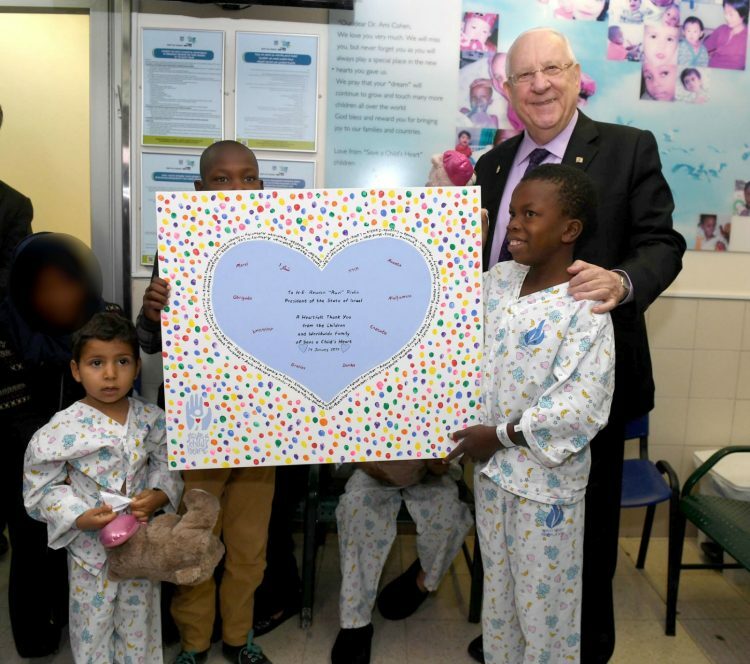 President Reuven on Monday visited children from developing countries being treated for heart conditions through the ‘Save a Child’s Heart’ at the Wolfson Medical Center in Holon, Israel. ‘Save a Child’s Heart’ was established in 1995 to improve medical treatment for children from developing countries who suffer from cardiac conditions and to establish treatment centers in those countries. The organization’s medical staff gives life-saving cardiac treatment and medical care to children from developing countries, trains doctors and nurses from all around the world in Israel and sends surgical and teaching missions to partner countries. “We often quote the saying ‘he who saves a single life is as if he has saved the whole world’. Behind each heart is not just a child, but a family, friends and community – a whole world,” said the president. The organization “is a wonderful example of how Israeli excellence works together with our concern and sense of obligation towards humanity. Israel was once a developing country. We became the start-up nation because we needed these solutions,” he added.